As Egypt Grows More Lawless, Army Chief Warns Against 'State Collapse' : The Two-Way After Egyptian president Mohammed Morsi imposes a 30-day state of emergency, thousands of protesters take to the street; the army chief warns the political instability could threaten the country's future. 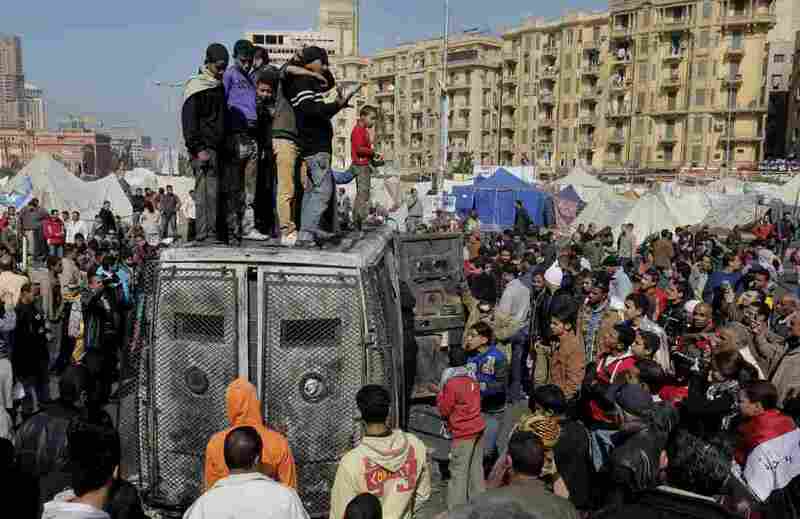 Protesters surround a burned Egyptian army vehicle in Cairo on Jan. 29, 2013. Egyptian protesters remain in the streets of Port Said and Suez, defying President Mohammed Morsi's declaration Sunday night of states of emergency and night-time curfews. Egyptian army troops are out on the streets but they did not interfere as thousands of people jeered Morsi's call. Reports of demonstrations and sabotage are coming in from other Egyptian cities, notes the Associated Press, citing damage to roads, train lines, government offices and police stations. The ongoing violence prompted Egypt's army chief, Abdel-Fattah el-Sissi to admonish political leaders to mend their fences. "The continuation of the conflict between the different political forces and their differences over how the country should be run could lead to the collapse of the state and threaten future generations." El-Sissi also serves as Egypt's defense minister. NPR's Leila Fadel tells NPR Newscasts that armed protesters in Port Said attacked military buildings and police indiscriminately fired their guns into angry crowds. She says Morsi's state of emergency decree has 'enraged' citizens, who haven't seen political or judicial reform in the two years since former president Hosni Mubarek was toppled. Violence dramatically increased Saturday after a court sentenced 21 men to death for their roles in a deadly soccer riot a year ago. Local residents were outraged and spilled into the streets to vent their anger. By the end of the weekend, more than 40 people were dead in rioting. As the New York Times explains, the courts are seen as politicized: the soccer hooligans received death sentences, but everyone accused of killing protesters during the Egyptian revolution two years ago (such as police) was acquitted. The security police have not been reformed, and with the new declaration of emergency rule in parts of Egypt, citizens won't have due process protections against abusive police. The AP says protesters are furious over abusive treatment by police, and Morsi's month long martial law declaration seems to approve of this. After Morsi spoke, thousands of people ridiculed his statement and immediately broke his evening curfew by returning to the streets in greater numbers than before. The Egyptian parliament, dominated by Morsi's political party, the Muslim Brotherhood and its allies, then approved legislation that lets the army arrest people, along with the police, reports the Financial Times. Morsi has called for dialogue with the opposition, and held his first meeting with a group of politicians on Monday. But the Financial Times says that group was mostly filled with Islamist parties. The secular National Salvation Front has rebuffed his call. Mohammed ElBaradei, the former head of the U.N.'s nuclear watchdog agency and now a liberal party leader, termed Morsi's outreach fruitless. "Without accepting his responsibility as a president for the latest bloody events, promising to form a government of national salvation and commissioning a balanced committee to amend the constitution, any dialogue will be a waste of time," ElBaradei told CNN.